On a crisp and frosty April morning in the North of Scotland in 2002, at the Findhorn Foundation ecovillage, some 250 activists and landscape restoration practitioners from all over the world declared the 21st Century as the ‘Century for Earth Restoration’. The conference was called by Alan Watson Featherstone who set up Trees for Life, a project that has since planted close to two million native trees to restore Scotland’s great ‘Caledonian Forest’. John Manocheri was the official UNEP delegate at the conference, and now — 17 years later — UN Environment has finally taken leadership on this issue and announced the ‘UN Decade on Ecosystems Restoration’ (2021–2030). I remember the conference well. How we all shared this sense of urgency back then already. How being surrounded by people sharing stories of hope from their ecosystems restoration projects around the world was deeply inspiring and yet at the same time news was flooding in that we were loosing biodiversity, forests, top soils, and wilderness so much faster than we were able to respond to. This is still the case, but the tide is turning. During the ‘circle of commitment’ at the conference I voiced my intention to set up an environmental education and sustainability training centre in Spain, and all these years later I am delighted to be on the advisory council of the Ecosystem Restoration Camps Foundation, who’s first camp is located in Souther Spain near Murcia. My own work as an educator writing curriculum for Gaia Education has helped to train more that 15k people from 125 countries around the world in the skills and frameworks necessary to engage in whole systems design for sustainability and regeneration. Growing numbers of people are committing their lives to healing the damage our species has done over the centuries and millennia to this abundant blue green planet. Projects have been established around the world that demonstrate that human beings as part of life are capable of creating conditions conducive to life. Life — as a planetary process — is a neg-entropic (or syntropic) force on Earth creating collaborative abundance by increasing diversity and complexity to improve healthy ecosystems functions which in turn create not just planetary bioproductivity but the overall conditions conducive to life. When David McConville from the Buckminster Fuller Institute and I started working with the Cloudburst Foundation to help organize a meeting at the Commonwealth Secretariat in London on the theme of ‘Regenerative Development to Reverse Climate Change’ in 2016, we started to map out regeneration projects around the world, which he has curated into this amazing map of inspiration through the possible (see below). Do take the time to browse this map! Each locator stands for a real project on the ground that has already had an impact and there is a little video with each of them to show their success. The Society of Ecological Restoration offers an online directory of business, civil society organizations and research institutions engaged in ecological restoration around the world. Regeneration International has since also launched The Regeneration Hub that brings together and show-cases regenerative agriculture projects around the world. The map of projects that made it into the finalists of the Lush Spring Prize for social and ecological regeneration also highlights how the ReGeneration is rising around the world. I am deeply grateful to be part of an amazing group of judges who have the privilege and the difficulty of deciding which 11 projects win a prize when all of them are amazing! The Ecosystems Restoration Camps movement is growing rapidly with new people joining every day and new camps being planned in Mexico, China and California, to name just a few. I have been writing and speaking about how the ‘UN Decade for Ecosystem Restoration’ could be a way of building the necessary momentum to turn the 21st century into the ‘Century of Earth Regeneration’. In August 2018 when the first suggestions were made to launch the UN decade, I wrote this piece on ‘Earth Rise: The UN Decade for Ecosystems Restoration & the Century of Regeneration’. It seems that E.F. Schumacher was right in suggesting that “we may not be able to raise the winds, but we can set sails, so when the winds come we are ready.” I believe that we are living through a global period of awakening to the harsh reality of potentially imminent collapse of some of our planet’s major life support systems and with it the early demise of our young (and still immature) species. Faced with a species-level ‘rite of passage’ moment of death or transformation we will witness millions and eventually billions rise in a global movement to avoid near-term-human-extinction (see Jem Bendell’s video on ‘Deep Adaptation’ and this Gaia U webinar on ‘Breakdown & Breakthrough’). In my opinion we know what to do: bioregionally focussed ecosystems restoration as a means to reverse global warming and over the course of the next 3 to 4 decades re-stabalize global climate patterns by reducing CO2 concentrations in the atmosphere to pre-industrial levels. Yet there is much more reason to follow this path. It offers a ‘deep adaptation’ pathway that builds local and bioregional resilience through creating regionally focussed circular biomaterials economies as we reinvent our material culture and move towards increased regional production for regional consumptions. In adopting locally attuned, decentralized patterns of meeting human needs that will no longer be dependent on nonreneawble sources of material and energy, we will increase our capacity to adapt and transform in response to change and an uncertain future. This place- and culture-sensitive process of redesigning the human presence and impact on Earth bioregion by bioregion will be much more than simply ‘ecosystems restoration’. It will be a pathway towards regenerating our communities, our societies, our regional economies — a path walked through glo-cal awareness and action, coming together in global collaboration to heal the Earth and her people one place at a time. A one minute video recorded at the meeting of the Commonwealth Secretariat in 2016 in which I speak to the potential for using ecosystems restoration and climate change reversal as a pathway to implementing all the Sustainable Development Goals of the UN (more videos here). 7VORTEX - Everything is connected! Last October, I offered a Gaia Education ‘Glocalizer Webinar’ on ‘Designing for Regeneration & Planetary Health: How to facilitate the emergence of positive change at local, bioregional and global scales’. In my (not-a-TEDx) Findhorn Talk shortly before I explored that same theme: ‘Human and Planetary Health: Ecosystems Restoration at the Dawn of the Century of Earth Regeneration’. Also last October, the Capital Institute launched a global regenerative communities network of bioregionally focussed regenerative hubs and my friend Joe Brewer moved down to Costa Rica to help Eduard Mueller and others to create a working example of bioregional regeneration as part of this new network of ReGen Hubs. I have been slowly nurturing my own bioregional approach on the island of Mallorca over the last 8 years — having chosen Mallorca as a place to live because it is an ideal case study for bioregional regenerative development (and how to initiated it). So I know from experienve that bioregional regenerative development is slow and humbling work, as we have to engage everyone and build alliance between people who usually do not talk to each other for a variety of different political, cultural and historical reasons. Ecosystems restoration and regenerative development together offer a practical pathway to redesign the human impact on Earth. This is the path towards becoming healers of the Earth and in the process heal ourselves and our relationships with each other and the community of life. I personally believe that this salutogenic intentionality describes the maturation process at the species level and the personal development process we are called to engage in. We need prototypes of bioregional regenerative development to pop up everywhere and contextualize ecosystems restoration as a pathway to revitalizing bioregional economies and decentralized productions systems in ways that can give meaningful work to people and strengthen community cohesion and resilience. The Commonland Foundation helped birth the Ecosystems Restoration Camps movement. 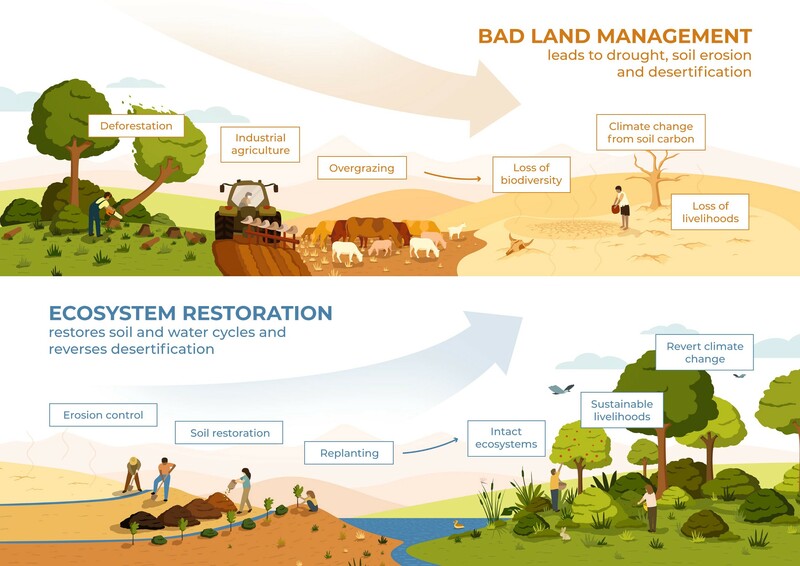 It also created an excellent framework for regional landscape restoration which can help in communicating the ecological, social, economic and inspirational significance of restoring healthy ecosystems functions through regional landscape restoration (see below). We are living through the most profound transformation of humanity’s relationship to this living planet we are conscious expressions of! We are waking up to and rediscovering traditional wisdom, understanding in a new way that whatever we do to the Earth and the ecosystems we inhabit we are doing to ourselves! Everyday, more people of all ages — thank you Greta Thunberg for activating the younger generations so effectively — are joining together to find new ways to be part of the solution rather than part of the problem. The ReGeneration is rising around the world. It might still look like there are too few of us and that the vested interests of a few are doing more damage than the shared vision and concerted actions of the many are able to undo in time for our species’ survival. Yet, if I compare what has happened since that cold Easter morning at the Restore the Earth conference in Findhorn in 2002, I am hopeful. We are waking up to collectively and individually embody this wisdom in a 21st Century way. Collaborative ecosystems restoration and regenerative bioregional development are pathways to re-indigenization, reinhabitation, a ‘Coming Home’. The Sustainable Development Goals of the United Nations will only have a transformative impact if people and communities everywhere get behind these goals, make them relevant to their communities and their culture and implement them in ways that are carefully adapted to the bio-cultural uniqueness of place. That is why I helped to develop Gaia Education’s SDG Flashcards and Training of Multipliers. The SDGs offer us a platform of shared goals that we can use to create cross-sector and multi-stakeholder conversations and collaborations to implement them in meaningful ways that lead beyond simply being sustainable to aiming to drive social and ecological regeneration. The UN Decade on Ecosystems Restoration, similarly, cannot be left to the UN or empty government rhetoric if we want the decade to have the potentially transformative impact that it urgently needs to have! We are all called to join together and to overcome the silos between disciplines, sectors and ideologies in an unprecedented collaborative effort to restore ecosystems everywhere and to heal the Earth. In that very process we will fall in love again with each other — as a human family — and rediscover a felt sense and embodyment of our interbing with the wider community of life. The saving grace as we face collapse on so many levels — with systemic patterns and processes that no longer serve unravelling around us — is that the path of ‘deep adaptation’ to the imminent breakdown and the path to avoid short-term human extinction are one and the same: we need to restore healthy ecosystems functions and we need to redesign the human impact on Earth by engaging in regenerative bioregional development — everywhere! Let us make the most of the ‘UN Decade on Ecosystems Restoration’! If we get it right, this decade will usher in the Century of Earth Regeneration!